Createspace Independent Publishing Platform, 9781475195484, 184pp. Jeremy Taylor's life is crumbling. His beloved Grandpa has died, his little sister is ill, his parents just argue, and his best friend's turned mean. What he doesn't know is that a hostile cosmic force is causing all his troubles. 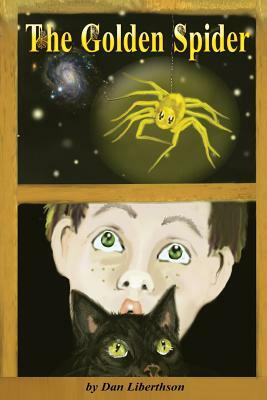 But when a golden, spider-like alien takes Jeremy and his faithful cat on a journey through Space and time, he learns he must fight to save himself, his family, and the whole world. Dan Liberthson was born in Rochester, NY and attended Northwestern University (BA, history) and SUNY at Buffalo (PhD, English). In addition to The Golden Spider, his first children's book, he has published three illustrated books of poetry for adults, which are described on his website, liberthson.com. His last poetry book, "Animal Songs" (2010), delves into the powerful presence of animals in our lives. Intimates in our homes, predators or prey in the wild, and inspirations in both worlds, they help us realize what it means to be alive. Other books include "The Pitch is On the Way: Poems About Baseball and Life (2008)," which explores baseball and what the game means to its fans, and "A Family Album" (2006), poems about his childhood in and growth out of an American Jewish family with a mentally ill sister.